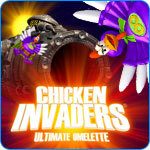 Chicken Invaders 4: Ultimate Omelette Game - Download and Play Free Version! Survive the Assault of the Marauding Chicken Menace! Save the world from sure destruction! Intelligent, intergalactic space chickens offended by the fact that earth chickens are bred and killed for their meat and eggs. The first time they came to Earth, they became so enraged that they wanted to destroy the planet. Each time, the zany, crispy-chicken-wing loving hero fought them off. Each time, the chickens came back. You're in control of a heroic spaceship with the mission of destroying the intergalactic Chicken Invaders and defending the Earth. As you encounter various types of Chicken Invaders, make sure to be quick and avoid the enemy's attacks or your ship will be destroyed. 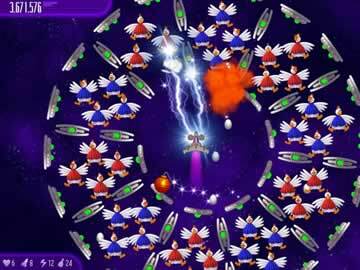 The Chicken Invaders franchise is a cult classic among indie gamers for its zany humor, bright cartoonish graphics, and smooth, minimalist gameplay. The goal is simple: shoot waves and waves of flying chickens until they die. This time, however, the chickens have developed a fiendish plan. The Giant Egg Cannon just destroyed the Death Star and is coming to Earth to destroy the planet. It will coat the earth with sticky white goo, and everything will be cooked by the heat of the sun. Gameplay is reminiscent of classic arcade games like Galaga and Space Invaders, but revamped with impressive graphics and entertaining twists. The dialogue in story mode set a fun and lighthearted stage for the game. There are three difficulty levels so novices and expert gamers alike can find a challenge and be kept on their feet. You can play Chicken Invaders 4 with the keyboard or with a mouse, depending on your style of play. And you can hold down the shooting button, but your weapon will overheat if you hold it down for too long, and you'll have to go without a weapon for an agonizing five seconds. The game requires a level of strategy to your shooting. The game is surprisingly replayable, with special unlocked weapons you purchase with keys and new levels with increasing challenges. 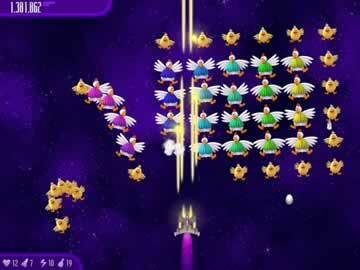 Chicken Invaders 4 is a quirky, addictive shooter that combines humorous lines with smooth gameplay. So if you're asked who will stand to defend earth in the face of this fun-filled threat? Only you!